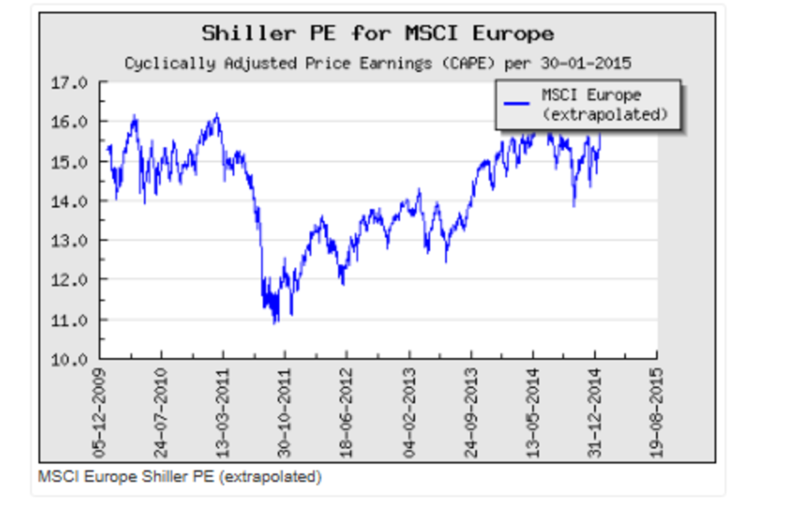 You are here: Home / Asset Management / Is Now the Time to Buy European Stocks? Is Now the Time to Buy European Stocks? Various financial analysts are issuing buy recommendations on European stocks. 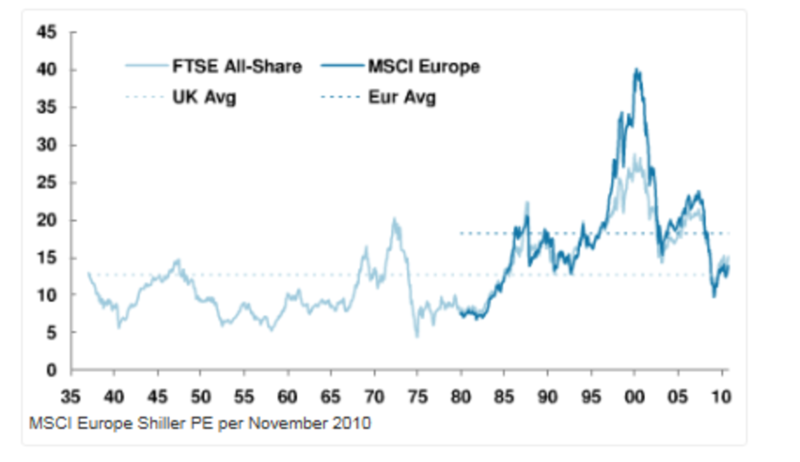 The general logic is that share price increases in Europe have fallen behind those of the US leaving European equities cheaper than their US counterparts. “The S&P 500 has risen 9.5 percent since Oct. 15, compared with a 6.6 percent gain for the Euro Stoxx 50 Index. That pushed the U.S. gauge’s valuation to 17 times projected earnings, compared with 14.1 times for the measure tracking the biggest euro-area stocks, data compiled by Bloomberg show” (Bloomberg News). Furthermore, the ECB recently announced a one trillion euro government bond buying program to revive the sagging euro zone economy. Together with existing schemes to buy private debt and funnel hundreds of billions of euros in cheap loans to banks, the new quantitative easing program will release 60 billion euros ($68 billion) a month into the Euro-zone economy. The announcement boosted European shares to a seven year high. However, it is questionable whether continued price appreciation of European shares is supported by fundamental factors and whether it is truly sustainable and attractive to long term investors. While it is factually correct that the US stock market has enjoyed significant gains in the last three years and that Europe has lagged behind (see chart below), it is, however, incorrect to conclude that European stocks are undervalued and will outperform US stocks in the long run. The relative performance of the US and European markets is relevant mostly from a behavioural economic perspective – Europe appears cheap, so investors may buy it, causing prices to rise. Further impetus for a recovery in EU share prices is reputed to be forthcoming in the form of a weaker euro which will boost demand for European goods abroad, including from the US. But exports to the US are a relatively small driver of demand in Europe in comparison to, lets say, China. More importantly only 22-23 percent of EU wide employment relates to production for foreign demand, including demand in other EU countries (Europa Economic Analysis). Domestic demand and a healthy local economy to foster the same are instead what matters for Europe. Recent ECB bond purchase action will most likely positively impact European shares in the short run but it still remains to be seen if it is enough to stimulate growth in the broader European economy. Bond purchases tend to impact asset valuations but do not trickle down easily into the rest of the economy. To ensure that share price valuation of European companies is sustainable in the long run, structural changes in the Euro zone economy may be also required. To understand what could happen to European stocks, investors need to look deeper and evaluate the fundamental drivers impacting European corporate profitability and expectations of future economic growth in the region. Let’s examine the underlying drivers by applying Warren Buffett’s approach to value investing and look at 1) whether European stocks are currently undervalued and 2) whether a meaningful catalyst exists that will change European stock valuations in 2015. Note: I used the Shiller P/E because I believe it to be a more reasonable market valuation indicator than the P/E ratio because it is adjusted to business cycle volatility and it eliminates fluctuation of the ratio caused by the variation of profit margins during business cycles. Economic Environment: The overall economic outlook for Europe continues to look weak. Fourth quarter 2014 GDP was essentially flat from a year ago (0.2%). Compare that to 5% GDP growth in the US over the same period. EU unemployment rates at 8% have not fallen meaningfully. Compare that to the steady fall of unemployment in the US to 5.5%. Given the economic picture drawn by stagnant GDP and persistent unemployment, European stocks appear appropriately discounted against US stocks. Structural Problems: In addition to the economic indicators above, the Euozone is plagued with significant structural problems, negatively impacting growth. A variety of fundamental factors continue to hinder Europe’s ability to reinvigorate its economic engine; these include an aging population, restrictions on the movement of both resources and talent between the various European countries, outdated and inefficient government policies for labor and businesses, and, perhaps most importantly, significant cultural, economic and political divides among the various EU member countries. Arguable Inadequate Stimulus: The most straightforward way central banks stimulate an economy is by lowering interest rates. However, if interest rates approach effectively 0%, the central bank and the government need to look for less traditional and harder to implement mechanisms to ignite the economic machine, such as government spending, government lending, and purchasing and holding private sector debt obligations by government entities. Mr. Draghi clearly shares this view:”The first step, as I said, was to lower overnight interest rates all the way to their effective lower bound – including below zero for the deposit facility. But once we reach this point, and if inflation is still too low and more monetary stimulus needed, the central bank has to adopt new instruments to fulfil its mandate.” Because of various reasons including the ECB’s leadership views of which policies are most effective and their limited legal authority, the ECB has failed to implement aggressive and meaningful asset purchases of the like that the Federal Reserve has now been running for years. Divided on most economic policies, the European countries have to buy into policy actions by the ECB. In general, the more stable economies, like Germany and the Scandinavian states, do not have direct incentives to help struggling euro area economies, such as Spain and Greece, seeing clearly only the risks of larger government debt and larger government balance sheets. Just this week, in fact, remarkably Germany celebrated its first balanced fiscal budget since 1969, while Spanish unemployment, for instance, has remained above 20% since December 2009. If investors were to carefully examine the fundamental economic, political and social indicators, it is difficult to find evidence that probabilistically Europe will recover significantly in 2015. Continued stagnation in Europe is a more likely scenario, and even the possibility of sliding into a recession has not yet been eliminated, particularly if ECB policies are not decisive and timely. In the long run, significant political, social and economic restructuring is needed if Europe is to find the catalyst to a new era of economic growth. But for now is is hard to find solid evidence that European stocks will outperform US stocks in the long run despite the fact that the european stock market has lagged behind the US in the last four years. If investors intend to add European stocks to their portfolio focusing on export- oriented companies with strong fundamentals in solid euro zone economies such as Germany would be my preferred bet. The author holds both US and European stocks. The opinions above are not recommendations to buy or sell any securities. The opinions above are purely the author’s and do not represent the views of any investment institution.